Expected Progeny Differences published by one breed are inherently not comparable to those published by another breed. This is due to several factors including differences in arbitrary base adjustments used by each breed, the lack of data from comparisons among animals of different breeds, and differences in selection emphasis for a specific trait in one breed compared to another. Consequently, producers who wish to compare bulls of different breeds must utilize across-breed adjustment factors. Currently the US Meat Animal Research Center (USMARC) calculates across breed adjustment factors for 18 breeds for growth and carcass traits including: birth weight, weaning weight, yearling weight, maternal milk, marbling score, ribeye area, and fat thickness. Producers can use these additive adjustment factors to adjust EPD to a common Angus base. Across-breed adjustments are updated annually to capture differences in base changes, genetic trends, and the addition of more data generated in the Germplasm Evaluation Project at USMARC. Each year new across-breed adjustment factors are released at the Beef Improvement Federation meeting. Current across-breed adjustment factors can be found at http://www.beefimprovement.org. As an example, to compare a Limousin or bull’s EPDs directly to an Angus bull’s EPDs bull buyers need to use the following adjustment factors to add to the Limousin bull’s EPDs: 2.3 (birth weight), -18.2 (weaning weight), -41.3 (yearling weight), -13.7 (milk). 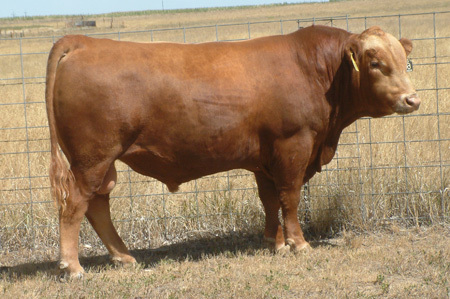 If a Limousin bull has a Milk EPD of 26, his Milk EPD on an Angus base would be 12.3 (26 – 13.7). For bull buyers wishing to directly compare bulls of different breeds this exercise is critical. To make this exercise easier, online across-breed EPD calculators are available at http://www.eBEEF.org. Breed association collaborations are underway that represent the opportunity to directly compare bulls of different breeds directly in the future. International Genetic Solutions (IGS) represents a partnership between 12 beef breed associations. Consequently, each participating breed association benefits from data contributed by partner breed associations enabling even more accurate EPDs when pedigree ties exist between breeds. These pedigree ties are evident when one thinks of SimAngus, LimFlex, Balancer, and Red Angus, as examples. However, to directly compare breeds in this multi-breed genetic evaluation breed differences and estimates of heterosis are needed to adjust the phenotypic data. In the future, these values from USMARC will be critical in allowing for direct comparison of breeds who decide to take part in such collaborations. For the spring 2017 bull buying season, the Across-Breed EPD adjustment factors are still required when comparing bulls of different breeds even within the IGS system.